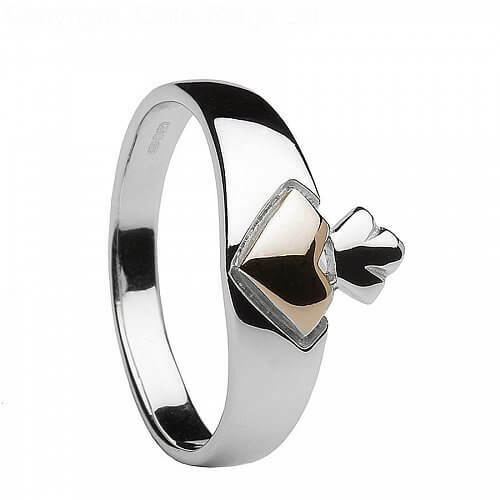 A modern take on a very classic design, the Claddagh ring is the ultimate sweetheart ring. 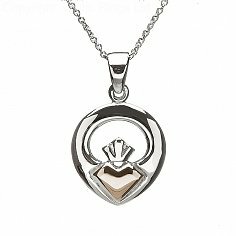 Learn more about the Claddagh here. Sterling silver and rose gold Claddagh ring, the heart in the center is made from rare Irish gold that has been ethically mined in County Tyrone, under licence. Wear a little piece of Ireland today! Hallmarked in the Dublin Assays Office for quality, this ring also comes with a certificate of authenticity and is presented in a luxury wooden box. 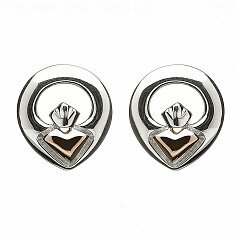 Service rating : A proprement parler nous n'avons rien a reprocher a " Celtic Rings". La bague est conforme à nos attentes. Mais le service de livraison via "Fed ex" est pitoyable ! C'est une chance que finalement ce cadeau pouvait être offert au nouvel an, car si non initialement prévu à noel nous nous serions trouvés fort désolés ! Product : Conforme au descriptif , très bien.